ACE Youth is our Active Community of Empowered young people aged 10-18. We co-ordinate eight inclusive youth groups in East Dunbartonshire, Fife and Angus for any young person of any ability living in these local authority areas. Our ACE youth groups in Fife are funded by Big Lottery Fund Scotland Young Start programme. Our youth groups offer young people a place of friendship and shared experiences. They celebrate diversity, ability and individuality. 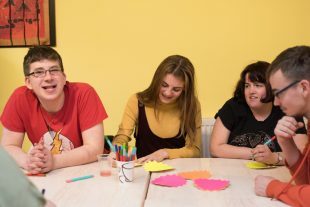 For young people who have a learning disability, these groups play a significant role in supporting them to feel valued and included in their community. On top of team sports, group games and activities, our youth groups offer our young people something distinctly different. Our youth co-ordinators bring an educational focus to meetings, encouraging discussion and group work on campaigns for an equal society for every person who has a learning disability. By sharing and understanding a common cause for an equal society, the young people are part of a mission. Each week they never fail to inspire us to be better and go further on behalf of every person who has a learning disability. You can read more about ACE Youth groups here. Contact us if you, a family member, or someone you know would like to join a local ACE Youth Group. Looking for more information about our funded projects? Find out more.